(Guest) J&C Studios O Gauge Archive Photo Poll: Dec. 2016 There will be some changes made! Topic: There will be some changes made! A B&O Class A-3 Atlantic with its passenger local in the 1950s, drifts along the eastbound main line as it approaches the Edgewater Yard Limit and passenger station on the Baltimore & New York Railway. Accelerating on its way west, is a new B&O RDC "Speedliner." It will be replacing the aging 4-4-2 in that time slot. Yes, changes will soon be made! Such it was back then. This is my last contest photo. I will no longer be posting any more layout scene photos because I've run out of them! Also, I hope my fellow members do not feel I've been "hogging the screen" with the string of photos that I have posted through this past year. Rather, I was hoping more members would share their modeling as well. When I joined in 2011, I was abut the only O scale 2 rail modeler here. However I did and still enjoy seeing work done in O gauge 3 rail as well. I now have an uncomfortable feeling that my 2 rail stuff may have turned off other modelers. If so, I sincerely apologize, as such was not my intent. 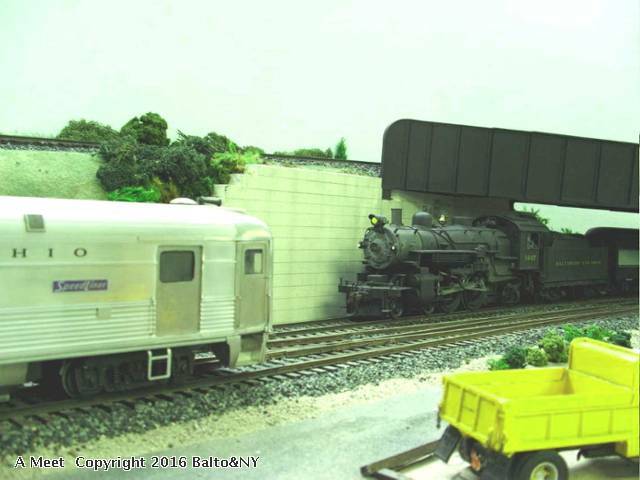 My photos are of the "Baltimore & New York" layout I began in 2004 and had to tear down in 2010 for a move. Advancing age and less space now, preclude building another. Oh yes, I recently put together a small fire place mantle diorama which was also featured here. A kind of 'flash in the pan,' so to speak. Seeing models, scenes and layouts of others helps me stay 'plugged in' to our great hobby. It's also one that is best enjoyed when shared. Ed I really like the 2 rail. Actually i prefer it but I'm just too invested in my current 3 rail setup to make a change. I enjoy your photos...sorry to hear this is the end of the line. Keep posting photos just change the perspective. The possibilities are endless. Your work gives others inspiration 2 rail or otherwise. I sure hope you don't hang it up for the reasons you indicate. Regardless of your decision, I wish you the best. Something from the late 1930s - A Scale Craft (later Walthers up to about 1953) 12 wheel depressed center flatcar in cast aluminum. Erie had five cars like this built in 1929 and in service until about 1950, at 135 tons capacity. They were replaced by heavier capacity cars with cast steel frames. N&W built one at their shops in 1948, matching all the basic dimensions of the Erie car, but rated with a 125 ton capacity. The Buckeye design trucks under this model are brass from a Kemtron kit made in the 1950s. The PRR, NY Central, Eire and New Haven had the largest fleets of this type car, often smaller and riding on 8 wheels. Rural electrification expansion through the 1930s helped create the need for cars like these to move over-size, heavy transformers and generating equipment from eastern factories to areas where the electric grid was expanding.